The TextLayoutFormat class holds all of the text layout properties. These properties affect the format and style of a text flow at the container level, paragraph level, and text level. Both the ContainerController class and the FlowElement base class have format properties that enable you to assign a TextLayoutFormat instance to them. Assign a TextLayoutFormat object to a container to affect the format of all of the container's content. Assign a TextLayoutFormat object to a FlowElement descendant to specify formatting for that particular element: TextFlow, ParagraphElement, DivElement, SpanElement, InlineGraphicElement, LinkElement, and TCYElement. In addition to the format property, these classes also define each of the individual TextLayoutFormat properties so that you can override the setting of a particular style property for that element, if you wish. Because you can set a given style at multiple levels, it is possible to have conflicts. For example, the color of the text at the TextFlow level could be set to black while a SpanElement object sets it to blue. The general rule is that the setting at the lowest level on the text flow tree takes precedence. So if the ligature level is set for a TextFlow instance and also set for a DivElement, the DivElement setting takes precedence. Cascading styles refers to the process of adopting styles from a higher level in the text flow if a style value is undefined at a lower level. When a style is undefined on an element at the point it is about to be rendered, it either takes its default value or the value cascades or descends from the value on a parent element. For example, if the transparency (textAlpha property) of the text is undefined on a SpanElement object, but is set on the TextFlow, the value of the TextFlow.textAlpha property cascades to the SpanElement object and is applied to the text for that span. The result of the cascade, or the sum of the styles that is applied to the element, is stored in the element's computedFormat property. In the same way, you can apply user styles using the userStyles property of the ContainerController and FlowElement classes. This property allows you to read or write a dictionary of user styles and apply its settings to a container or a text flow element. The user styles dictionary is an object that consists of stylename-value pairs. Styles specified by the userStyles property take precedence over all others. Most styles that are undefined inherit the value of their immediate parent during a cascade. A small number of styles, however, do not inherit their parent�s value and take on their default values instead. Alpha (transparency) value for the background (adopts default value if undefined during cascade). Background color of the text (adopts default value if undefined during cascade). Amount to shift the baseline from the dominantBaseline value. Number of text columns (adopts default value if undefined during cascade). Specifies the amount of gutter space, in pixels, to leave between the columns (adopts default value if undefined during cascade). Column width in pixels (adopts default value if undefined during cascade). [read-only] Returns the coreStyles on this TextLayoutFormat. [static] [read-only] Returns a TextLayoutFormat object with default settings. Specifies the default bidirectional embedding level of the text in the text block. The size of the text in pixels. Controls word wrapping within the container (adopts default value if undefined during cascade). Defines the formatting attributes used for links in normal state. Defines the formatting attributes used for links in hover state, when the mouse is within the bounds (rolling over) a link. Defines the formatting attributes list markers. Legal values are ListStylePosition.INSIDE, ListStylePosition.OUTSIDE, FormatValue.INHERIT. Default value is undefined indicating not set. If undefined during the cascade, this property inherits its value from an ancestor. Legal values are ListStyleType.UPPER_ALPHA, ListStyleType.LOWER_ALPHA, ListStyleType.UPPER_ROMAN, ListStyleType.LOWER_ROMAN, ListStyleType.NONE, ListStyleType.DISC, ListStyleType.CIRCLE, ListStyleType.SQUARE, ListStyleType.BOX, ListStyleType.CHECK, ListStyleType.DIAMOND, ListStyleType.HYPHEN, ListStyleType.ARABIC_INDIC, ListStyleType.BENGALI, ListStyleType.DECIMAL, ListStyleType.DECIMAL_LEADING_ZERO, ListStyleType.DEVANAGARI, ListStyleType.GUJARATI, ListStyleType.GURMUKHI, ListStyleType.KANNADA, ListStyleType.PERSIAN, ListStyleType.THAI, ListStyleType.URDU, ListStyleType.CJK_EARTHLY_BRANCH, ListStyleType.CJK_HEAVENLY_STEM, ListStyleType.HANGUL, ListStyleType.HANGUL_CONSTANT, ListStyleType.HIRAGANA, ListStyleType.HIRAGANA_IROHA, ListStyleType.KATAKANA, ListStyleType.KATAKANA_IROHA, ListStyleType.LOWER_ALPHA, ListStyleType.LOWER_GREEK, ListStyleType.LOWER_LATIN, ListStyleType.UPPER_ALPHA, ListStyleType.UPPER_GREEK, ListStyleType.UPPER_LATIN, FormatValue.INHERIT. Default value is undefined indicating not set. If undefined during the cascade, this property inherits its value from an ancestor. A Number that specifies, in pixels, the amount to indent the paragraph's end edge. A Number that specifies the amount of space, in pixels, to leave after the paragraph. A Number that specifies the amount of space, in pixels, to leave before the paragraph. A Number that specifies, in pixels, the amount to indent the paragraph's start edge. The rendering mode used for this text. Assigns an identifying class to the element, making it possible to set a style for the element by referencing the styleName. [read-only] Returns the styles on this TextLayoutFormat. Alignment of lines in the paragraph relative to the container. Alignment of the last (or only) line in the paragraph relative to the container in justified text. A Number that specifies, in pixels, the amount to indent the first line of the paragraph. Number in pixels (or percent of fontSize, like 120%) indicating the amount of tracking (manual kerning) to be applied to the left of each character. Number in pixels (or percent of fontSize, like 120%) indicating the amount of tracking (manual kerning) to be applied to the right of each character. [read-only] Returns the userStyles on this TextLayoutFormat. Vertical alignment or justification (adopts default value if undefined during cascade). Specifies the optimum, minimum, and maximum spacing (as a multiplier of the width of a normal space) between words to use during justification. Creates a new TextLayoutFormat object. Replaces property values in this TextLayoutFormat object with the values of properties that are set in the incoming ITextLayoutFormat instance. Concatenates the values of properties in the incoming ITextLayoutFormat instance with the values of this TextLayoutFormat object. Copies TextLayoutFormat settings from the values ITextLayoutFormat instance into this TextLayoutFormat object. [static] Creates a new TextLayoutFormat object. Returns the value of the style specified by the styleProp parameter, which specifies the style name. [static] Compares properties in ITextLayoutFormat instance p1 with properties in ITextLayoutFormat instance p2 and returns true if all properties match. Sets properties in this TextLayoutFormat object to undefined if they do not match those in the incoming ITextLayoutFormat instance. Sets properties in this TextLayoutFormat object to undefined if they match those in the incoming ITextLayoutFormat instance. Specifies the baseline to which the dominant baseline aligns. 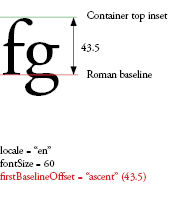 For example, if you set dominantBaseline to ASCENT, setting alignmentBaseline to DESCENT aligns the top of the text with the DESCENT baseline, or below the line. The largest element in the line generally determines the baselines. This example sets alignmentBaseline to three different values - USE_DOMINANT_BASELINE, DESCENT, and IDEOGRAPHIC_CENTER - for three spans in a paragraph that has dominantBaseline set to ASCENT. Alpha (transparency) value for the background (adopts default value if undefined during cascade). A value of 0 is fully transparent, and a value of 1 is fully opaque. Display objects with alpha set to 0 are active, even though they are invisible. Background color of the text (adopts default value if undefined during cascade). Can be either the constant value BackgroundColor.TRANSPARENT, or a hexadecimal value that specifies the three 8-bit RGB (red, green, blue) values; for example, 0xFF0000 is red and 0x00FF00 is green. Amount to shift the baseline from the dominantBaseline value. Units are in pixels, or a percentage of fontSize (in which case, enter a string value, like 140%). Positive values shift the line up for horizontal text (right for vertical) and negative values shift it down for horizontal (left for vertical). Specifies a vertical or horizontal progression of line placement. Lines are either placed top-to-bottom (BlockProgression.TB, used for horizontal text) or right-to-left (BlockProgression.RL, used for vertical text). If undefined during the cascade, this property inherits its value from an ancestor. If no ancestor has set this property, it will have a value of BlockProgression.TB. Controls where lines are allowed to break when breaking wrapping text into multiple lines. Set to BreakOpportunity.AUTO to break text normally. Set to BreakOpportunity.NONE to not break the text unless the text would overrun the measure and there are no other places to break the line. Set to BreakOpportunity.ANY to allow the line to break anywhere, rather than just between words. Set to BreakOpportunity.ALL to have each typographic cluster put on a separate line (useful for text on a path). The type of CFF hinting used for this text. CFF hinting determines whether the Flash runtime forces strong horizontal stems to fit to a sub pixel grid or not. This property applies only if the renderingMode property is set to RenderingMode.CFF, and the font is embedded (fontLookup property is set to FontLookup.EMBEDDED_CFF). At small screen sizes, hinting produces a clear, legible text for human readers. Controls how text wraps around a float. A value of "none" allows the text to wrap most closely around a float. A value of "left" causes the text to skip over any portion of the container that has a left float. A value of "right" causes the text to skip over any portion of the container that has a right float. A value of "both" causes the text to skip over any floats. Legal values are ClearFloats.START, ClearFloats.END, ClearFloats.LEFT, ClearFloats.RIGHT, ClearFloats.BOTH, ClearFloats.NONE, and FormatValue.INHERIT. If undefined during the cascade, this property has a value of ClearFloats.NONE. RangeError — When set value is not within range for this property. Color of the text. A hexadecimal number that specifies three 8-bit RGB (red, green, blue) values; for example, 0xFF0000 is red and 0x00FF00 is green. Number of text columns (adopts default value if undefined during cascade). The column number overrides the other column settings. Value is an integer, or FormatValue.AUTO if unspecified. If columnCount is not specified,columnWidth is used to create as many columns as can fit in the container. If undefined during the cascade, this property has a value of FormatValue.AUTO. If undefined during the cascade, this property has a value of 20. Column width in pixels (adopts default value if undefined during cascade). If you specify the width of the columns, but not the count, TextLayout will create as many columns of that width as possible, given the container width and columnGap settings. Any remainder space is left after the last column. Value is a Number. Returns the coreStyles on this TextLayoutFormat. The coreStyles object includes the formats that are defined by TextLayoutFormat and are in TextLayoutFormat.description. The returned coreStyles object consists of an array of stylename-value pairs. Returns a TextLayoutFormat object with default settings. This method always returns the same object. The type of digit case used for this text. Setting the value to DigitCase.OLD_STYLE approximates lowercase letterforms with varying ascenders and descenders. The figures are proportionally spaced. This style is only available in selected typefaces, most commonly in a supplemental or expert font. The DigitCase.LINING setting has all-cap height and is typically monospaced to line up in charts. Type of digit width used for this text. This can be DigitWidth.PROPORTIONAL, which looks best for individual numbers, or DigitWidth.TABULAR, which works best for numbers in tables, charts, and vertical rows. If undefined during the cascade, this property inherits its value from an ancestor. If no ancestor has set this property, it will have a value of Direction.LTR. Specifies which element baseline snaps to the alignmentBaseline to determine the vertical position of the element on the line. 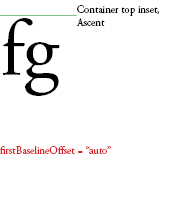 A value of TextBaseline.AUTO selects the dominant baseline based on the locale property of the parent paragraph. 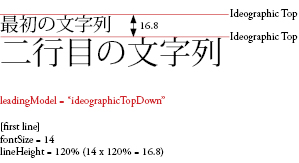 For Japanese and Chinese, the selected baseline value is TextBaseline.IDEOGRAPHIC_CENTER; for all others it is TextBaseline.ROMAN. These baseline choices are determined by the choice of font and the font size. Specifies the baseline position of the first line in the container. Which baseline this property refers to depends on the container-level locale. 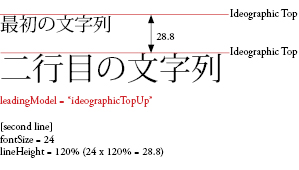 For Japanese and Chinese, it is TextBaseline.IDEOGRAPHIC_BOTTOM; for all others it is TextBaseline.ROMAN. 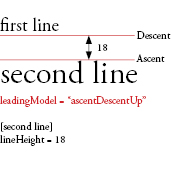 The offset from the top inset (or right inset if blockProgression is RL) of the container to the baseline of the first line can be either BaselineOffset.ASCENT, meaning equal to the ascent of the line, BaselineOffset.LINE_HEIGHT, meaning equal to the height of that first line, or any fixed-value number to specify an absolute distance. BaselineOffset.AUTO aligns the ascent of the line with the container top inset. If undefined during the cascade, this property inherits its value from an ancestor. If no ancestor has set this property, it will have a value of BaselineOffset.AUTO. The name of the font to use, or a comma-separated list of font names. The Flash runtime renders the element with the first available font in the list. For example Arial, Helvetica, _sans causes the player to search for Arial, then Helvetica if Arial is not found, then _sans if neither is found. Font lookup to use. Specifying FontLookup.DEVICE uses the fonts installed on the system that is running the SWF file. Device fonts result in a smaller movie size, but text is not always rendered the same across different systems and platforms. Specifying FontLookup.EMBEDDED_CFF uses font outlines embedded in the published SWF file. Embedded fonts increase the size of the SWF file (sometimes dramatically), but text is consistently displayed in the chosen font. Style of text. 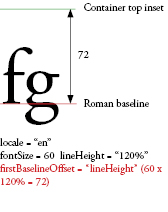 May be FontPosture.NORMAL, for use in plain text, or FontPosture.ITALIC for italic. This property applies only to device fonts (fontLookup property is set to flash.text.engine.FontLookup.DEVICE). Weight of text. May be FontWeight.NORMAL for use in plain text, or FontWeight.BOLD. Applies only to device fonts (fontLookup property is set to flash.text.engine.FontLookup.DEVICE). Rule used to justify text in a paragraph. Default value is FormatValue.AUTO, which justifies text based on the paragraph's locale property. For all languages except Japanese and Chinese, FormatValue.AUTO becomes JustificationRule.SPACE, which adds extra space to the space characters. For Japanese and Chinese, FormatValue.AUTO becomes JustficationRule.EAST_ASIAN. In part, justification changes the spacing of punctuation. 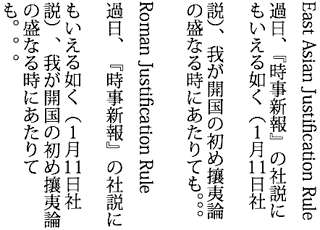 In Roman text the comma and Japanese periods take a full character's width but in East Asian text only half of a character's width. Also, in the East Asian text the spacing between sequential punctuation marks becomes tighter, obeying traditional East Asian typographic conventions. Note, too, in the example below the leading that is applied to the second line of the paragraphs. In the East Asian version, the last two lines push left. In the Roman version, the second and following lines push left. If undefined during the cascade, this property inherits its value from an ancestor. If no ancestor has set this property, it will have a value of FormatValue.AUTO. The style used for justification of the paragraph. Used only in conjunction with a justificationRule setting of JustificationRule.EAST_ASIAN. Default value of FormatValue.AUTO is resolved to JustificationStyle.PUSH_IN_KINSOKU for all locales. The constants defined by the JustificationStyle class specify options for handling kinsoku characters, which are Japanese characters that cannot appear at either the beginning or end of a line. If you want looser text, specify JustificationStyle.PUSH-OUT-ONLY. If you want behavior that is like what you get with the justificationRule of JustificationRule.SPACE, use JustificationStyle.PRIORITIZE-LEAST-ADJUSTMENT. Kerning adjusts the pixels between certain character pairs to improve readability. Kerning is supported for all fonts with kerning tables. Specifies the leading model, which is a combination of leading basis and leading direction. 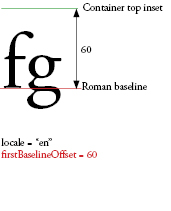 Leading basis is the baseline to which the lineHeight property refers. 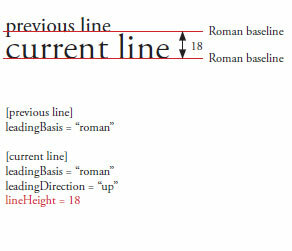 Leading direction determines whether the lineHeight property refers to the distance of a line's baseline from that of the line before it or the line after it. The default value of FormatValue.AUTO is resolved based on the paragraph's locale property. For Japanese and Chinese, it is LeadingModel.IDEOGRAPHIC_TOP_DOWN and for all others it is LeadingModel.ROMAN_UP. If undefined during the cascade, this property inherits its value from an ancestor. If no ancestor has set this property, it will have a value of LeadingModel.AUTO. Controls which of the ligatures that are defined in the font may be used in the text. The ligatures that appear for each of these settings is dependent on the font. A ligature occurs where two or more letter-forms are joined as a single glyph. Ligatures usually replace consecutive characters sharing common components, such as the letter pairs 'fi', 'fl', or 'ae'. They are used with both Latin and Non-Latin character sets. The ligatures enabled by the values of the LigatureLevel class - MINIMUM, COMMON, UNCOMMON, and EXOTIC - are additive. Each value enables a new set of ligatures, but also includes those of the previous types. Controls word wrapping within the container (adopts default value if undefined during cascade). Text in the container may be set to fit the width of the container (LineBreak.TO_FIT), or can be set to break only at explicit return or line feed characters (LineBreak.EXPLICIT). If undefined during the cascade, this property has a value of LineBreak.TO_FIT. Leading controls for the text. 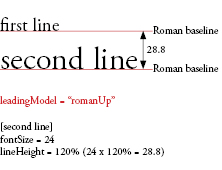 The distance from the baseline of the previous or the next line (based on LeadingModel) to the baseline of the current line is equal to the maximum amount of the leading applied to any character in the line. This is either a number or a percent. If specifying a percent, enter a string value, like 140%. Defines the formatting attributes used for links in normal state. This value will cascade down the hierarchy and apply to any links that are descendants. Accepts inherit, an ITextLayoutFormat or converts an array of objects with key and value as members to a TextLayoutFormat. If undefined during the cascade, this property inherits its value from an ancestor. If no ancestor has set this property, it will have a value of null. Defines the formatting attributes used for links in hover state, when the mouse is within the bounds (rolling over) a link. This value will cascade down the hierarchy and apply to any links that are descendants. Accepts inherit, an ITextLayoutFormat or converts an array of objects with key and value as members to a TextLayoutFormat. If undefined during the cascade, this property inherits its value from an ancestor. If no ancestor has set this property, it will have a value of 40. Defines the formatting attributes list markers. This value will cascade down the hierarchy and apply to any links that are descendants. Accepts inherit, an IListMarkerFormat or converts an array of objects with key and value as members to a ListMarkerFormat. If undefined during the cascade, this property inherits its value from an ancestor. If no ancestor has set this property, it will have a value of ListStylePosition.OUTSIDE. If undefined during the cascade, this property inherits its value from an ancestor. If no ancestor has set this property, it will have a value of ListStyleType.DISC. The locale of the text. Controls case transformations and shaping. Standard locale identifiers as described in Unicode Technical Standard #35 are used. For example en, en_US and en-US are all English, ja is Japanese. Bottom inset in pixels. Default of auto is zero except in lists which get a start side padding of 45. (adopts default value if undefined during cascade). Space between the bottom edge of the container and the text. Value is a Number or auto. Left inset in pixels. Default of auto is zero except in lists which get a start side padding of 45. (adopts default value if undefined during cascade). Space between the left edge of the container and the text. Value is a Number or auto. Right inset in pixels. Default of auto is zero except in lists which get a start side padding of 45. (adopts default value if undefined during cascade). Space between the right edge of the container and the text. Value is a Number or auto. Top inset in pixels. Default of auto is zero except in lists which get a start side padding of 45. (adopts default value if undefined during cascade). Space between the top edge of the container and the text. Value is a Number or auto. A Number that specifies, in pixels, the amount to indent the paragraph's end edge. Refers to the right edge in left-to-right text and the left edge in right-to-left text. A Number that specifies the amount of space, in pixels, to leave after the paragraph. Collapses in tandem with paragraphSpaceBefore. A Number that specifies the amount of space, in pixels, to leave before the paragraph. Collapses in tandem with paragraphSpaceAfter. A Number that specifies, in pixels, the amount to indent the paragraph's start edge. Refers to the left edge in left-to-right text and the right edge in right-to-left text. The rendering mode used for this text. Applies only to embedded fonts (fontLookup property is set to FontLookup.EMBEDDED_CFF). If undefined during the cascade, this property has a value of null. Returns the styles on this TextLayoutFormat. Note that the getter makes a copy of the styles dictionary. The coreStyles object encapsulates all styles set in the format property including core and user styles. The returned object consists of an array of stylename-value pairs. Specifies the tab stops associated with the paragraph. Setters can take an array of TabStopFormat, a condensed string representation, undefined, or FormatValue.INHERIT. The condensed string representation is always converted into an array of TabStopFormat. Alignment of lines in the paragraph relative to the container. TextAlign.LEFT aligns lines along the left edge of the container. TextAlign.RIGHT aligns on the right edge. TextAlign.CENTER positions the line equidistant from the left and right edges. TextAlign.JUSTIFY spreads the lines out so they fill the space. TextAlign.START is equivalent to setting left in left-to-right text, or right in right-to-left text. TextAlign.END is equivalent to setting right in left-to-right text, or left in right-to-left text. Alignment of the last (or only) line in the paragraph relative to the container in justified text. If textAlign is set to TextAlign.JUSTIFY, textAlignLast specifies how the last line (or only line, if this is a one line block) is aligned. Values are similar to textAlign. Alpha (transparency) value for the text. A value of 0 is fully transparent, and a value of 1 is fully opaque. Display objects with textAlpha set to 0 are active, even though they are invisible. Decoration on text. Use to apply underlining; default is none. A Number that specifies, in pixels, the amount to indent the first line of the paragraph. A negative indent will push the line into the margin, and possibly out of the container. Specifies options for justifying text. Default value is TextJustify.INTER_WORD, meaning that extra space is added to the space characters. TextJustify.DISTRIBUTE adds extra space to space characters and between individual letters. Used only in conjunction with a justificationRule value of JustificationRule.SPACE. If undefined during the cascade, this property inherits its value from an ancestor. If no ancestor has set this property, it will have a value of TextJustify.INTER_WORD. Number in pixels (or percent of fontSize, like 120%) indicating the amount of tracking (manual kerning) to be applied to the left of each character. If kerning is enabled, the trackingLeft value is added to the values in the kerning table for the font. If kerning is disabled, the trackingLeft value is used as a manual kerning value. Supports both positive and negative values. Number in pixels (or percent of fontSize, like 120%) indicating the amount of tracking (manual kerning) to be applied to the right of each character. If kerning is enabled, the trackingRight value is added to the values in the kerning table for the font. If kerning is disabled, the trackingRight value is used as a manual kerning value. Supports both positive and negative values. Returns the userStyles on this TextLayoutFormat. The userStyles object includes the formats that are defined by TextLayoutFormat and are not in TextLayoutFormat.description. The returned userStyles object consists of an array of stylename-value pairs. Vertical alignment or justification (adopts default value if undefined during cascade). Determines how TextFlow elements align within the container. If undefined during the cascade, this property has a value of VerticalAlign.TOP. Collapses or preserves whitespace when importing text into a TextFlow. WhiteSpaceCollapse.PRESERVE retains all whitespace characters. WhiteSpaceCollapse.COLLAPSE removes newlines, tabs, and leading or trailing spaces within a block of imported text. Line break tags () and Unicode line separator characters are retained. Specifies the optimum, minimum, and maximum spacing (as a multiplier of the width of a normal space) between words to use during justification. 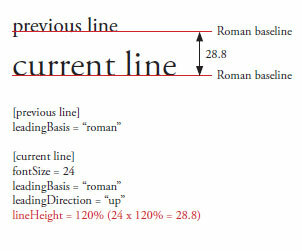 The optimum space is used to indicate the desired size of a space, as a fraction of the value defined in the font. The minimum and maximum values are the used when textJustify is distribute to determine how wide or narrow the spaces between the words may grow before letter spacing is used to justify the line. If undefined during the cascade, this property inherits its value from an ancestor. If no ancestor has set this property, it will have a value of 100%, 50%, 150%. Creates a new TextLayoutFormat object. All settings are empty or, optionally, are initialized from the supplied initialValues object. initialValues:flashx.textLayout.formats:ITextLayoutFormat (default = null) — optional instance from which to copy initial values. Replaces property values in this TextLayoutFormat object with the values of properties that are set in the incoming ITextLayoutFormat instance. Properties that are undefined in the incoming ITextLayoutFormat instance are not changed in this object. incoming:flashx.textLayout.formats:ITextLayoutFormat — instance whose property values are applied to this TextLayoutFormat object. This example applies the settings in one TextLayoutFormat object to a second one (textFormatLayout) and uses the receiving object to format the text. // add text to the span, the span to the paragraph, and the paragraph to the text flow. Concatenates the values of properties in the incoming ITextLayoutFormat instance with the values of this TextLayoutFormat object. In this (the receiving) TextLayoutFormat object, properties whose values are FormatValue.INHERIT, and inheriting properties whose values are undefined will get new values from the incoming object. Non-inheriting properties whose values are undefined will get their default values. All other property values will remain unmodified. incoming:flashx.textLayout.formats:ITextLayoutFormat — instance from which values are concatenated. This example adds values that are set in one TextLayoutFormat object to corresponding properties whose values are undefined in a second object (textFormatLayout) and uses the receiving object to format the text. Concatenates the values of properties in the incoming ITextLayoutFormat instance with the values of this TextLayoutFormat object. In this (the receiving) TextLayoutFormat object, properties whose values are FormatValue.INHERIT, and inheriting properties whose values are undefined will get new values from the incoming object. All other property values will remain unmodified. This example adds values of one TextLayoutFormat object to corresponding properties whose values are undefined in a second TextLayoutFormat object, but only if the property can inherit. The example formats the text with the result in the receiving TextLayoutFormat object. span.text = "Notice that the value of backgroundColor is "
"because it is not undefined." Copies TextLayoutFormat settings from the values ITextLayoutFormat instance into this TextLayoutFormat object. If values is null, this TextLayoutFormat object is initialized with undefined values for all properties. incoming:flashx.textLayout.formats:ITextLayoutFormat — optional instance from which to copy values. This example uses copy() to override the default format settings in one TextLayoutFormat object with a TextLayoutFormat object that has some formatting properties set. initialValues:Object — Optional instance from which to copy initial values, if an ITextLayoutFormat object's values are copied. Otherwise this parameter is treated like a Dictionary or Object and iterated over. Compares properties in ITextLayoutFormat instance p1 with properties in ITextLayoutFormat instance p2 and returns true if all properties match. p1:flashx.textLayout.formats:ITextLayoutFormat — instance to compare to p2. p2:flashx.textLayout.formats:ITextLayoutFormat — instance to compare to p1. incoming:flashx.textLayout.formats:ITextLayoutFormat — instance against which to compare this TextLayoutFormat object's property values. This example calls removeClashing() to remove from textLayoutFormat2 any formatting values that are different in textLayoutFormat. It sets the differing values to undefined, cancelling the values that were applied. span.text = "Notice that fontFamily (Arial, Helvetica, _sans) is applied." This example calls removeMatching() to remove from textLayoutFormat any formatting values that match those in textLayoutFormat2. span.text = "Notice that fontFamily (Arial, Helvetica, _sans) is not applied." This example formats a paragraph with 15 pixel margins, a 20 pixel first line indent, and a left-aligned tab stop at 40 pixels. It uses the Arial font (with alternate device fonts), sets the size to 14 pixels, the color to green, turns on kerning, and sets leading (lineHeight) is to 140%. 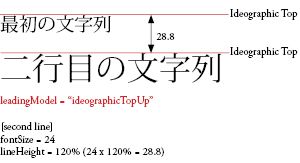 This example converts a string of Japanese characters in Unicode to a text flow and sets TextLayoutFormat properties to display it vertically, from right to left. textLayoutFormat.fontFamily = String.fromCharCode(0x5C0F, 0x585A, 0x660E, 0x671D) + " Pro R"; // "Kozuka Mincho Pro R"                    koFont.fontName = "Adobe " + String.fromCharCode(0xBA85, 0xC870) + " Std M"; // "Adobe Myungjo Std M"